1. Why was Pantai Hill Watch created? Some residents felt that the truth about events on Pantai Hill needed to be documented and shared with visitors, to keep resorts in-check. We also believe that by highlighting bad practices and providing suggestions and opinions, it helps prevent decay and improve the hill. 2. What does Pantai Hill Watch do? We document bad practices and present it to visitors to make a conscious decision on resort choice. Residents benefit other residents by sharing information and suggestions that are useful in improving communal life on the hill. 3. What is the main goal of Pantai Hill Watch? To ultimately reach a stage where all residents, resorts and visitors are comfortable with each others presence. We have reached this goal when a ‘community agreement’ is adopted and is being practiced by all. 4. Who can join Pantai Hill Watch? All residents who do not run resorts, are inclined towards nature conservation and protection and have interest in communal living are eligible. 5. How does Pantai Hill Watch involve local stakeholders? The indigenous and local village people share the gift of the Berembun forest reserve with us. We try to preserve this eco-system for all, highlight mistreatment and abuse in their employment and organise community activities that benefit their lives in various ways. 6. How can Pantai Hill visitors help residents? When visitors become aware of a resort’s continued bad practices, they can help by not giving them business and recommend others to follow. Visitors can refrain from making excessive noise by choosing to holiday in small groups that are non-party and non-corporate (no team building sessions). Visitors can also submit a complaint to Pantai Hill Watch via its website. 7. What profile of Visitors are suitable for Pantai Hill? Individuals, couples and small families looking for a tranquil get-away in nature are suitable visitors. 8. How is a resort defined? A property with amenities like a swimming pool and cooking faclities which is available for daily rental with hired staff is deemed a resort (on Pantai Hill). Property owners who do not permanently reside at the premise further implies this resort definition. 9. 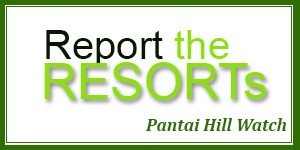 How does Pantai Hill Watch regulate the resorts? A direct intervention with guests seems the most effective. Subsequently, our documentation of bad practices, sharing of reports with the local police and the local village head will help put pressure on offenders. Our appeal to resort guests/visitors to withdraw support and patronage to offending resorts will also help regulate them. This side-steps a typical complaint to the authorities, which takes time and can be derailed by corruption. 10. Who does Pantai Hill Watch work with to enforce regulation? Our first choice are visitors themselves and their critique of a resort. Subsequent players include the local police, village headman, indigenous population and the Town Council in Nilai. 11. Are resorts on Pantai Hill legal? 3. Operating a resort business without the appropriate licenses. 12. What do the laws actually say?